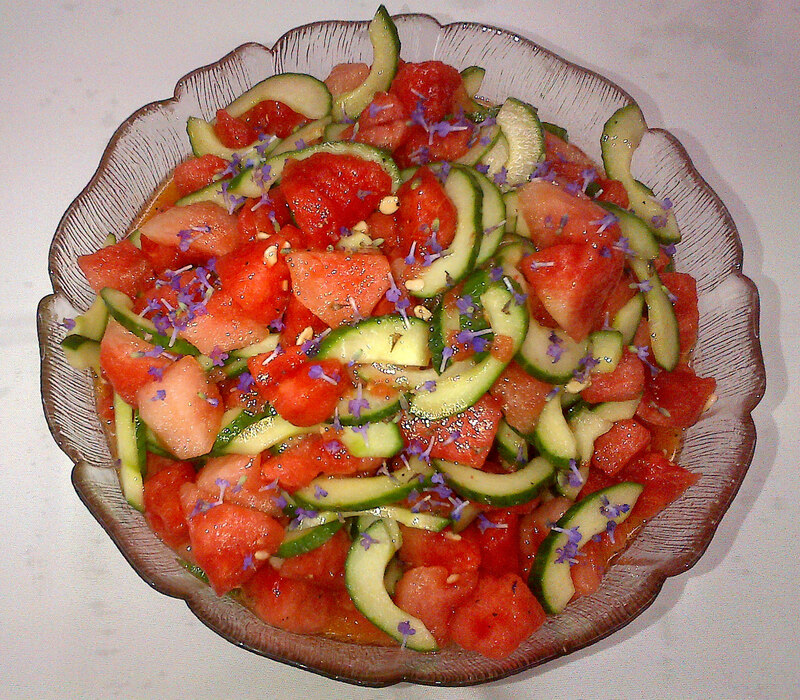 This Watermelon-Cucumber Salad will keep you cool in the fierce heat we have been experiencing! I notice that a year (less a day) ago we posted another photo of this salad by a different cook and a different photographer. I find it interesting to see how different the interpretations of the same recipe can be! Of course, this year the kitchen herb garden is a year more established (and has had the loving attentions of our amazing gardening volunteers) and has produced the lovely lavender flowers apparent above. We are also producing our own chives, sage, thyme, lovage, rose petals, bay leaves, mint…. a cornucopia of herbs! Here is another excellent way to beat the heat … tastefully. Let the soup sit covered in the fridge overnight and adjust seasoning. Other vegetables you have in abundance can be chopped finely and added to this soup. Best enjoyed on a patio with a good view ….